Sometimes, a picture paints a thousand words. Look at story one vs story two – more on Abhisit’s role later (although one wonders when the quotation marks around committed were added). NOTE: Thanks to a reader for the screenshot although was going to use the photo of Abhisit and Yoonie for a caption contest – Thaksin Abhisit seems barely awake listening to Yoon. 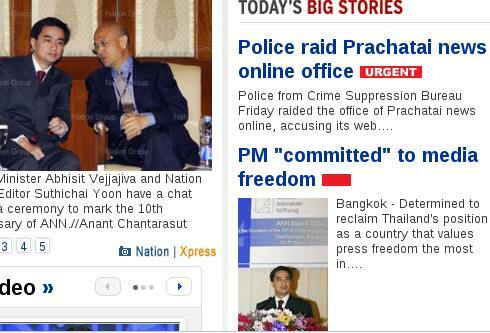 The Bangkok-based Prachatai website is well-known for carrying content that Thai newspapers will not publish. Thailand’s reputation for media freedom has suffered in recent years, in particular through lese-majeste laws, which ban criticism of the monarchy. Armed with an arrest warrant Thai police entered the offices of Prachatai, and detained Chiranuch Premchaiporn, the woman who founded the popular news website five years ago. She has been charged under a new law which makes it an offence to carry computer content that endangers national security. When asked to explain what kind of content had brought about the charge, the police refused to comment, saying it was too sensitive. But one officer, who did not want to be named, told the BBC it was comments about the monarchy posted by readers on the website at the end of last year that were at issue. The Thai authorities have been increasingly intolerant of perceived criticism of the monarchy in recent months. Thousands of websites have been blocked, and a number of people charged and arrested, including a well-known academic, who fled to Britain before he could be detained. However the use of the severe lese-majeste law has provoked widespread condemnation around the world, and a campaign by academics to have the law changed. By instead invoking the new computer crimes law – passed just 18 months ago – the authorities may be hoping to stifle debate about the monarchy without stirring up another outcry over freedom of expression in Thailand. BP: That last point is interesting although going after someone under the Computer Crimes Act is much easier as it is much broader – see below. Chuwat Rerksirisuk, Prachatai editor, says he has yet to see details of the charge against Prachatai Director Chiranuch Premchaiporn, but only knows that comments posted by readers and left displayed on the web-board led to the arrest. Any service provider intentionally supporting or consenting to an offence under Section 14 within a computer system under their control shall be subject to the same penalty as that imposed upon a person committing an offence under Section 14. BP: Don’t know what the specific comments are about, but am not surprised they are also including subsection (1) as no member of the Royal Family have ever done anything wrong and so any criticism of them is lese majeste. Well that and arguing the truth of your statements is also a further instance of lese majeste. Any hope that the new Democrat Party government of Prime Minister Vejjajiva Abhisit, who is usually described as “urbane” and “Oxford-educated,” would lighten up on the war against free expression ended Friday when two van-loads of police descended on the offices of Prachatai, a leading independent Thai-language website in Bankgkok, to arrest Chiranut Prempreecha, the woman who founded the website and serves as its coordinator. BP: Should note for the record that BP does not think the Abhisit government was behind the raid and arrest (well, surely Abhisit is not stupid enough to give a major talk on media freedom and then do the raid the very same day). However, it seems highly unlikely that his government will willingly do something about the law on its own (will get to Abhisit and other Democrats statements of LM law in another post). One could state they are surprised or shocked, but BP is neither. Did anyone expect anything different?